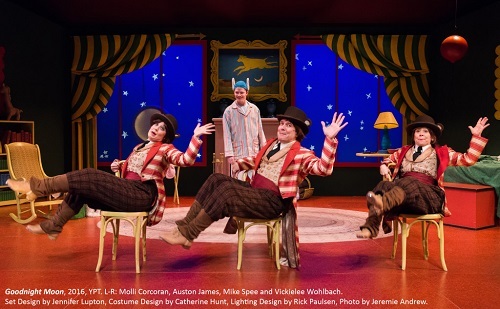 Young People’s Theatre has imported this delightful production of Goodnight Moon by Seattle Children’s Theatre, based on the classic picture book where a bunny says “goodnight” in rhyming verse to all the objects in his green-walled bedroom. I was curious to see how they’d make a play out of a book with no narrative, and was pleased with their innovation: each object becomes a living thing with its own story. This involved a lot of stage mechanics to make clocks, lamps, etc. seem to move of their own accord, thrilling the young audience. Mike Spee and Vickielee Wohlbach play, respectively, the little bunny and his “old lady” caretaker with adorable ears sprouting from the sides of their hats. Molli Corcoran who plays the “young mouse” mentioned in the text, among other characters, such as cat with a violin. This cat is not in the original book, but the bunny does say goodnight to the “cow jumping over the moon”, illustrated as a picture hanging on the bedroom wall. This invites the production to do a spirited take on “Hey Diddle Diddle” where the poor cow, Clarabell, has to learn to keep trying if she ever wants to jump over the moon. The fourth cast member onstage is Auston James who, like everyone except for Spee, plays a number of characters, the most memorable of which may be the tooth fairy. I fully enjoyed the gender-flip of a man-fairy in a tuxedo with wings and think it’s important to express gender diversity to kids. My kid’s take on the tooth fairy was that his physical antics while trying to retrieve the tooth out from under the bunny’s pillow without waking anybody was pretty funny. Wohlbach gets to join in the fun of multiple characters after the old lady leaves the room, hoping that the bunny will go to bed on his own (a frustration I entirely empathize with.) She plays the dish who runs away with the spoon in Hey Diddle Diddle, and all three non-Spee performers get to play bears. This is another scene where art comes to life: in the original book there is a painting of three bears sitting in chairs. In the show, tap dancing bears play musical chairs, with impressive choreography. One notable feature of the “great green room” in the story is that it has not one but two callbacks to Runaway Bunny, the first book by writer Margaret Wise Brown illustrator Clement Hurd (a picture from Runaway Bunny hangs on the wall and the book itself is on the bookshelf.) So it makes sense that this production includes a Runaway Bunny scene but, frankly, that books creeps me out and I found the song and dance even more disturbing. Runaway Bunny features a mother rabbit dashing her child’s daydreams of running away by describing all the fantastical ways she’d follow him. The number in the play literally has as its chorus “never gonna get away”, or wording to that effect, which I can’t help hearing as disastrous messaging for any child in an abusive domestic situation. When I asked my 3.5 year old what he liked about Goodnight Moon he enthusiastically claimed that he “loved everything!” When pressed he said that “the bed” was his favourite, and I’m not surprised. The stage mechanics wherein the bed covers crept down over the bunny’s body of their own accord, leading to a frenzied tug-of war, received uproarious laughter from the primarily 4 to 7 year old audience. (Though, to be honest, I may have chuckled myself.) This was perfectly timed, not just in sync with the crew member pulling the cables behind scenes, but also with the pianist, Jeff Bell, who musically interpreted the struggle. Bell plays all the music throughout, which greatly enriched the texture of the show. The “how did you do…” of stage mechanics dominated the questions in the Q&A after the show. Be forewarned though – there is not enough time for the performers to answer every small raised hand so if you have a kid who is determined to get their word in, as I do, you may have to console them with a cookie afterward.